Some years ago, Sean Bonniwell, the charismatic leader of the Music Machine, penned an evocative memoir of his life and music days, "Beyond The Garage". The book's title was no doubt in deference to the Machine's posthumous definition in rock histories as a 'garage band', a classification the singer/songwriter admits took him some time to comprehend. But the truth is, the Music Machine were nothing of the sort. They could only be considered a garage band because they happened to rehearse in one, and that garage was, equally, a sonic foundry, psychoanalyst's couch, philosopher's salon and boot camp. 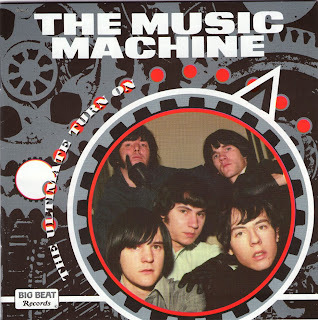 The Machine certainly articulated the frustration central to the restless spirit of mid-1960s grass roots Rock 'n' Roll, both musically and lyrically, but their expression of it came as much from the mind as the heart. The truth is, the Music Machine defy categorisation, because they simply did not sound like anyone else, before or since. Similarly, the fleeting chart status of Talk Talk', the group's ode to lack of selfesteem, has relegated the Music Machine in the minds of the myopic to that of one-hit wonders; for those who understand, however, the record was the brilliant opening salvo in a catalogue that has yet to be surpassed. More than anything, the sheer quality of the group's songs, arrangements and performances, speaks for itself. Each member was necessary to making the whole thing work, and together they shared a purpose and a drive that made the group unbeatable, and should have made them superstars. 'Ahead of their time' is a cliche but with hindsight their individuality is clearer than ever. 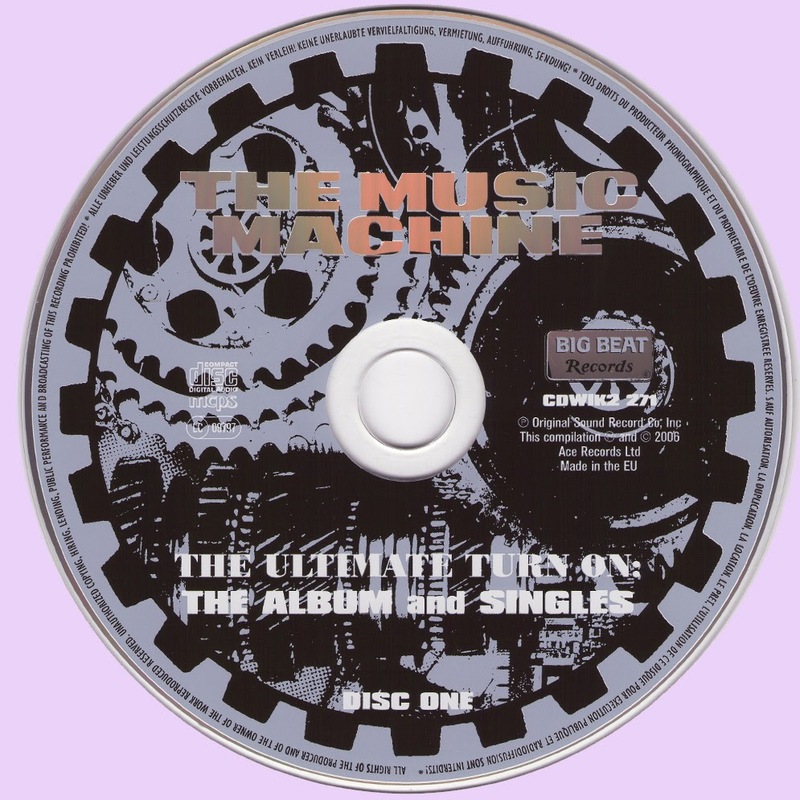 The Machine's time was one of tremendous upheaval in pop music, particularly on the west coast. When flower power was raging the Music Machine was the weed killer. 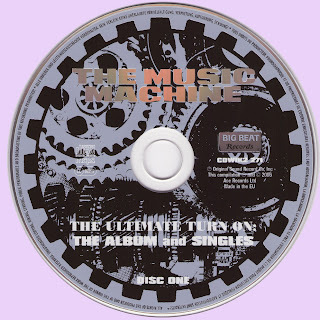 The saga of the Machine has been told before, not least by Sean Bonniwell in his autobiography, but it is hoped that what follows present a fresh perspective on the incandescent fourteen month lifespan of the initial Music Machine. 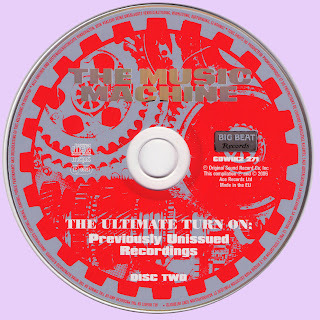 That is the purpose of "The Ultimate Turn On": to celebrate the original, definitive line-up of this once-in-a-lifetime combo. Ninety per cent of what they decanted to tape is present and, in its monophonic state, correct - mono being the best way to appreciate the Machine, and preferably at a loud volume. Disc One, comprising their entire Original Sound output, is the essential Music Machine. The rehearsals, demos and alternate mixes on Disc Two are offered as an illuminating adjunct, an insight into the workings of this incredible band. They also approximate how a second album for Original Sound might have shaped up, had they stayed together. These offcuts are gems that any other combo of that era would gladly trade their fuzzbox for. Finally, the footage of a black-clad Machine on the rarely-glimpsed "Boss City" TV show, pounding through Talk Talk', gives the neophytes amongst us an inkling uf what all the fuss was - and is - about. To be sure, Bonniwell and producer Brian Ross went on to create further fine records, such as 'Dark White'. 'Me, Myself & I' and 'You'll Love Me Again', under the Bonniwell Music Machine imprimatur, but in many ways these were still variations on the theme wrought in iron by the first line-up. The experience of being a cog in the Machine left some a spent force; for others, it provided a platform to go on to bigger things. But to a man, the original line-up is completely aware of the serendipitous chemistry they had together. They were the ultimate. All Songs written by Sean Bomniwell except where noted. All Songs written by Sean Bomniwell. Love their Sundazed cd aswell same tracks but i LOVE the band great songs sound eveything!